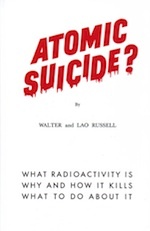 Book by Walter Russell and Lao Russell. This is the book that Nikola Tesla advised Russell bury for a 1,000 years. This book is in two parts. The first discusses the dangers of working with radioactive forces which Russell calls "death" while the second part is the science Nikola Tesla said humanity was not ready to know. Atomic Suicide - images - List of images appearing in the book.